Currently the deserialization re-create new sub-object with object_to_populate. This option permit to make object_to_populate recursive. I don't think those issues are addressed. @joelwurtz you have right, an object collection in the parent has no populated object, the problem is to have a reference for linked the object passed in the 'object_to_populate' and the object received by decoding. @jewome62 You need to rebase the PR as we don't merge PRs with merge commits. This PR was squashed before being merged into the 4.3-dev branch (closes #30607). in #30888 i am adding phpdoc to these configuration constants to explain what they do and what values they accept. as this is already merged, i will rebase #30888 and document it there. and extract the test for this into a trait like we do the other tests there. this overwrites the context. i think this means that if there are more loops, you might have a previous object to populate in the context. i think we should unset OBJECT_TO_POPULATE if it does not find anything and when the DEEP_OBJECT_TO_POPULATE flag is not true. we found where OBJECT_TO_POPULATE is unset. so this is fine as is. i will try to do a test and fix to make OBJECT_TO_POPULATE more robust, as i think there are edge cases that would lead to weird behaviour. OBJECT_TO_POPULATE is meant to specify the top level object. 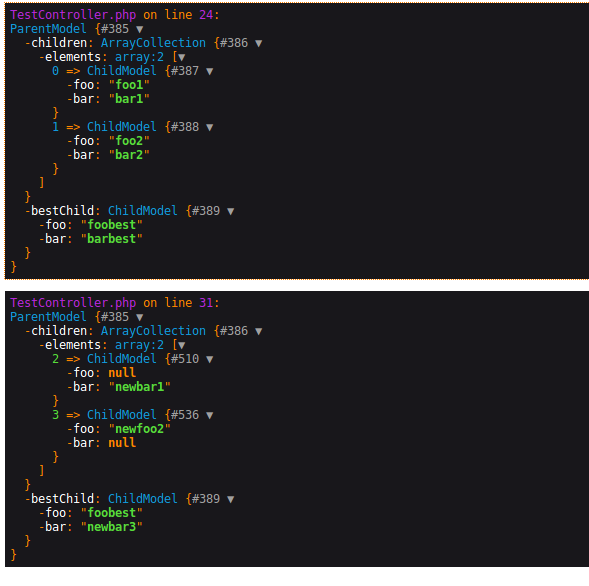 The implementation left the option in the context and it would be used whenever we have the first element that matches the class. #30607 (to master) introduces the feature to also keep the instances of attributes to deeply populate an existing object tree. In both cases, we do not want the mix up to happen with what the current OBJECT_TO_POPULATE is.